The Hawai‘i State Society of Washington, D.C. ʻUkulele Hui has been in existence for 20 years. The members meet weekly for not only for good music, food, and fun, but also the opportunity to learn to play on the versatile instrument, the ʻukulele and sing songs of different genres. Throughout the years, we have performed at many different venues and occasions in the metropolitan D.C. area. We have performed at fundraisers, multicultural programs, lū‘au for various organizations, etc. More than two-thirds of the performances are gratis. Promoting the interests of HSS and maintaining its mission statement, we are true ambassadors of the Society in promoting and perpetuating the culture of Hawai‘i in song and dance, spreading aloha spirit everywhere we go. The members pay nothing for lessons/tuition. The only requirement is that you be a good standing member of HSS. Our advertising is through the HSS’s website, Facebook, HSS eNupepa, word-of-mouth, etc. Generated income has defrayed some of the costs of our uniforms throughout the years. 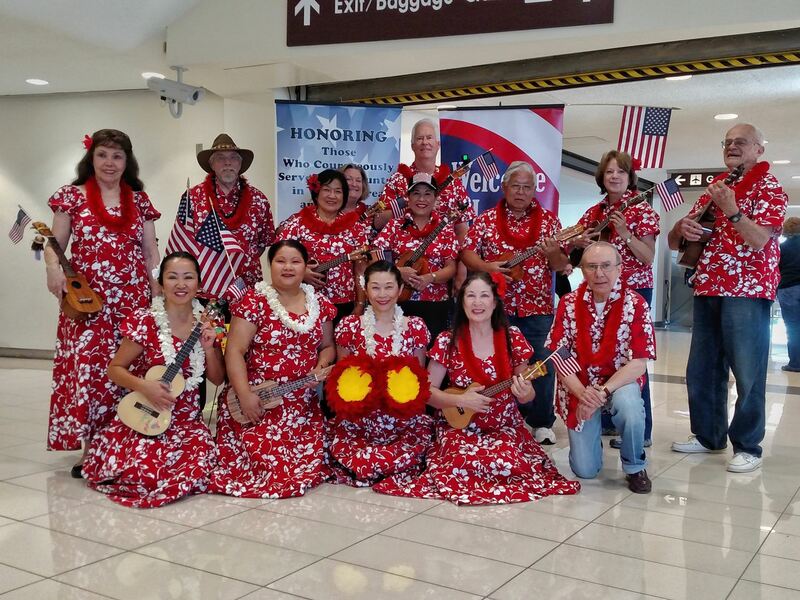 ʻUkulele hui musicians and dancers who participated in the Honor Flight of 80 veterans from Peoria, at National Reagan Airport. May 9, 2017. Over the past years, the Hui has performed at many retirement homes, rehabilitation facilities and senior centers; promotion and retirement celebrations; APA/diversity/multicultural festivals in the metropolitan D.C. area; at public libraries and schools; special events at the Smithsonian Institution; the George Washington and Georgetown University Lūʻau; the National Christmas Tree Lighting Ceremony in D.C.; welcoming Honor Flights at Reagan-National International Airport, that bring WWII, Korean War, and Vietnam veterans to visit Washington, D.C.; and special presentations focusing on the flowers and foliage at the U.S. Botanic Garden. The Hui participates in every annual King Kamehameha Lei Draping Ceremony at the Capitol, presenting their hand-made 13-foot long lei to the statue. The Hui also welcomed the Hokuleʻa when it visited the area in May 2016. The HSS ʻUkulele Hui has one primary objective: to spread the aloha spirit throughout the area through music in song and dance. The group includes over 50 active HSS members. It continues to be “Ambassadors of Aloha” for HSS. If you are a member of HSS and are interested in joining the group, please contact Carol at itaka2u@yahoo.com and/or (703) 281-3797.